Make a scale between an orange red and a greeny blue. Try to maintain constant tonal values across the scale by adding a little white, as you did in the previous exercise. At the mid point at more white the result should be grey. This is known as a broken or tertiary colour and this type of colour makes up the appearance of much of our world. In this part of the exercise I worked from brilliant red which had a very orange hue to turqoise as can be seen in the upper scale in the image. The middle mixes are more of a blue-green grey which isn’t very clear from the photo. Working with these orange red and turquoise produced some very interesting and quite pleasant broken colours which did surprise me and it has got me interested in experimenting with colours in future paintings. Make a carefully graded scale between a pair of secondary colours choose either orange to violet, green to orange or violet to green. Mix in white to maintain equal tones throughout (the lightest tone is orange). Once again the middle mixes lose chroma to become broken/tertiary colours. Here I worked with orange to a blue violet but lightened it up with white to take away some of the blue hue. 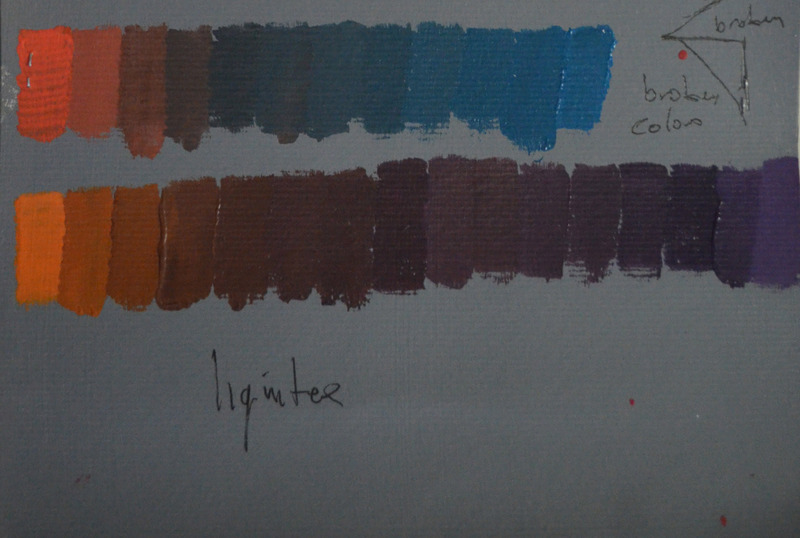 These two colours produced more interesting colours than the first scale, here are some of the colour mixes that I made using these two colours as some are hard to describe, Orange, Ginger, Red-Brown, Chocolate, Grey – Brown, Brown-violet, and various tones of grey-violet. This entry was posted in 1 Understanding Colour, 4 - Broken or Tertiary Colours, Pt 2 - Close to Home and tagged broken colors, broken or tertiary colours, oca painting 1 course, part 2 close to home, tertiary colours, understanding colour on February 24, 2015 by Mark A Smith.